While a third of the country struggles it's way up out of the dark (including me! ), a new guest reviewer arrives - Harry Hosono! He's doing a review of the new 12" Mattel Batman. Take it away, Harry! I'm probably not the only one these days who has been finding really great new toys almost every time I go out. Kingdom Come, Marvel Legends IV, the beginnings of the Return Of The King onslaught, the list goes on. 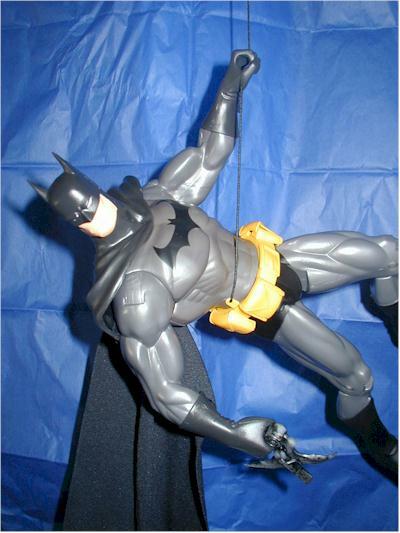 Also, like most of you, the one I really wanted to find was the new Mattel Zipline Batman. Michael reviewed that action figure here a few days ago and I was in full agreement with him on it's greatness. Imagine my surprise when I walk into Toys-R-Us yesterday and find this - (essentially) a 12" Zipline Batman! Was I the only one unaware that this was even coming out? 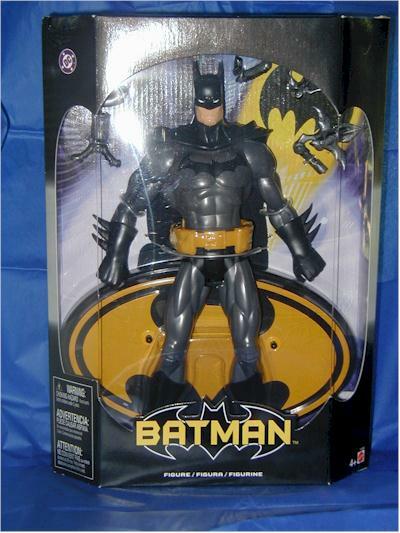 review that Mattel's Batman packaging is nice but a bit plain, this new 12" packaging is a bit snazzier. Batman's in a slightly angular box with a simple black design with a big window on front showing the same bat-signal and cityscape from the 6" figure's inside and a nice, big graphic on back. Inside, not only are the twisty ties kept to a minimum (no Kingdom Come Hawkman here), but, all the plastic holding Batman's accessories can be safely removed from slots in the back. No glue, no tape - totally re-sealable. I could almost just cut & paste MIchael's previous comments about this sculpt being "a-freakin'-mazing" - it's even more so in this 12" scale. Same boots, same cloth cape, and, except for two improvement's, same everything. 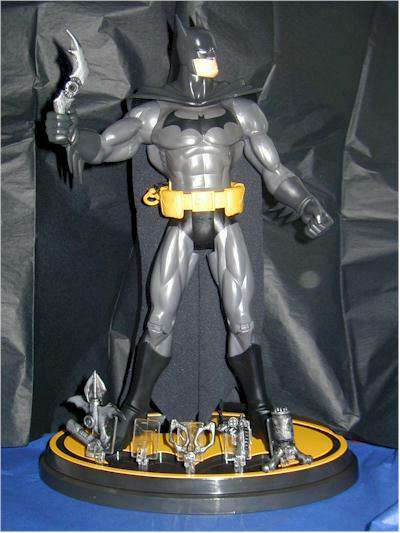 This 12" Batman's costume is much more of a glossy dark silver than the flat grey of his 6" counterpart. I would imagine this (and all of these high gloss "stealth armor" silvers) are mainly to grab a kid's attention from across the aisle. I'm happy with this color variation, I actually think this color looks a little more dynamic in the 12" scale, and there's still the same crisp lines with no over spray and super sharp Bat emblem. Really clean! One small complaint I had is that the flesh tone was a tad orange and glossy. This could just be a personal opinion so I wouldn't think of deducting anything from the score. I think that Mattel really deserves some praise here. First, Batman has five hand-held accessories; handcuffs, torch, Batarang, rope launcher and a kind of Batarang gun - and all of them can actually fit in his hands! They are made of a semi soft (kid safe) plastic and not only have a really nice grey-with-black-wash paint scheme but all of the sculpts make it look as if Batman has really been using these things for a while - check out the picture! Batman also has a base. While the addition of a base to 12" figures is pretty standard what make's this base special are the five small clear plastic stands for Batman's accessories! Each of the five small plastic stands also has a raised diagram indicating which accessory corresponds with it and then fits into slot's on the base itself. No more little pieces floating around, it all fits together. All of this would have probably been enough, but I give Mattel props for a little extra touch; (I think) for the first time Batman's all-important utility belt gets in on the action! The two front pouches on Batman's belt are actually spring loaded and can be opened and closed. There's even a tiny Bat-computer and Bat-PDA inside! requires some huge button or lever that just gets in the way. Batman's action feature not only pretty cool but it is so subtle you might not even know it's there. 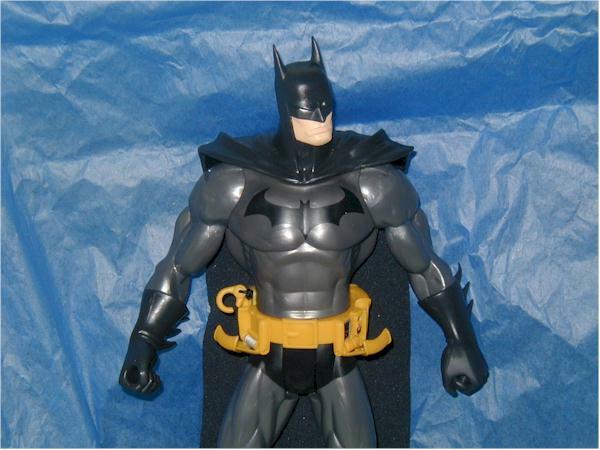 On the right side of Batman's utility belt is a small yellow clip. 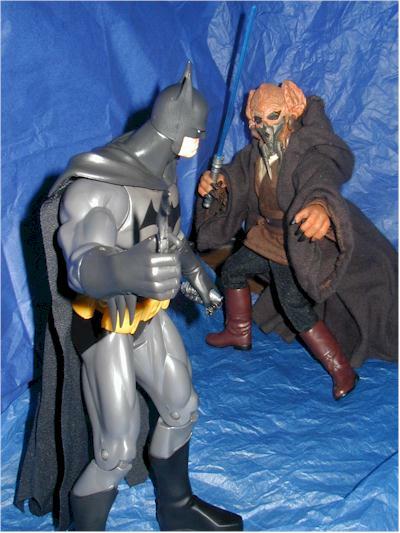 Attach this to his Batarang and you now have a telescoping Bat-rope. Not only is it super cool but it adds tons to your (dis)play potential. When you are done just press the button carefully hidden on Batman's back and the rope retracts snugly to it's place at Batman's side. Toys-R-Us. It will probably be the same price at Target or Wal-Mart but I wouldn't be surprised if it was almost $35.00 at places like K*B Toys. Shop wisely. I've had this figure for a day or so and seem to have a hard time putting it down! And while this figure is a bit expensive it still has a lot going for it; a great Four Horsemen sculpt, great accessories, great action feature, collector friendly packaging and lots of nice, extra touches. With this figure in particular I think Mattel is really trying to show their commitment to walking the fine line between both a collector and kid friendly toy. They did a great job here. Hit the local Toys R Us, and you should find him on the shelf without too much trouble. If you don't have a TRU nearby, you can find it on-line at Time and Space Toys. Figures from the collection of Harry Hosono.